Despite an overall slowdown in the recording industry, musicians continued to innovate and some of that creative output managed to find its way onto record. Whether a bluesy new kind of big band jazz from Kansas City or exotic steel guitar from Hawaii, recorded music continued to grow in leaps and bounds. Bennie Moten was the top bandleader in Kansas City and “Moten Swing” was his signature tune. This recording from December 1932 displays a big band swing sound as fully realized as if it had been recorded a decade later. Moten himself does not play on this recording, leaving the piano to a rising star in his band, William “Count” Basie. 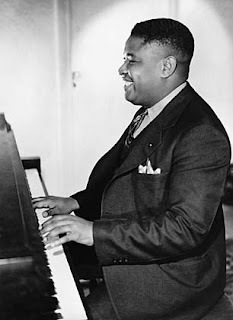 Basie starts the song with a simple but swinging introduction, and he demonstrates an uncanny sense of musicianship throughout as he provides prominent, though spare, accompaniment that perfectly accents the orchestra and soloists. The rhythm section, led by former Blue Devils bandleader Walter Page on bass, is simply phenomenal, creating a propulsive rhythm that is impossible not to dance to. The soloists are also quite good, including Eddie Barefield on alto sax, Ben Webster on tenor and Oran “Hot Lips” Page on trumpet. Sadly, Moten would die in 1935, just as the big band era was beginning, but the Kansas City jazz sound he helped pioneer would live on through the alumni of this incredible orchestra. Art Tatum is widely considered to be the greatest jazz pianist and one of the most technically gifted soloists of all time. Listening to “Tiger Rag,” it is hard not to be overwhelmed by the dazzling speed and complexity. Tatum’s improvisational flourishes seem to know no bounds as he makes use of the entire keyboard to unleash a succession of notes more intense than anyone had previously dreamed of. And yet, even more amazingly, the piece never seems out of control. The song’s original melody is still recognizable beneath the impressive ornamentation, and despite the impossible pace, Tatum executes with an exacting precision. A case in point: with just under a minute to go in the song, Tatum is playing a complex back-and-forth melody and his right hand starts racing up the keyboard. He surprises the listener by not stopping where one would expect, but continuing to the highest keys. He then reverses and heads back down at the same breakneck tempo. This is impressive so far if only for its speed, but then something magical happens: he stops hitting every key and makes it sound as if his fingers have tripped, their momentum carrying them, bouncing, the rest of the way until they “regain their feet” and run headfirst into the next complex passage. The whole breathtaking exchange takes less than 10 seconds, and can be quickly overlooked in the rush, but if your brain can keep up, these little details are marvelous to witness. Ted Weems was a popular bandleader who scored a number of novelty hits beginning in the 1920s. “Heartaches” was originally issued in 1933, but it did not become a hit until it was reissued 14 years later (RCA Victor 20-2175). Its recognition in 1947 was long overdue, as it is an incredibly enjoyable listen. The record is built on a hyperactive, almost polyrhythmic drum beat, over which a rapid succession of novel instruments repeat the main melody (including some fine whistling at one point by Elmo Tanner). Finally, the rhythm drops away and the orchestra holds the last few notes together to bring the melody to a sweet, almost nostalgic end – punctuated by a final cymbal crash at the end. Note that Weems and his band recorded this song in 1938 as well (first released as Decca 25017 in 1947). That version is a bit slower, but still quite enjoyable, with some more great whistling by Tanner. However, the Bluebird/Victor version remains the definitive one. The development of Hawaiian music is a microcosm of American music in general: a multicultural blend that yielded something unique and unexpectedly wonderful. Traditional island chants were first augmented by stringed instruments (guitar and ukulele) and new singing styles introduced by Mexican, Portuguese and other immigrants in the early 19th Century. As the island nation came under the influence of the U.S., elements of American popular music and jazz were also incorporated. On top of this rich mix, Hawaiians added their own innovations. The most significant of these was the invention of “steel guitar,” where the guitar is played horizontally in the lap while a metal bar (“steel”) or other object is slid along the strings to change the pitch – a technique that soon became a staple of American country music and strongly influenced the “bottleneck” slide guitar style frequently used by blues musicians (the primary difference being that bottleneck guitar is played in the standard position rather than horizontally). Hawaiian steel guitar is on strong display in “My Little Grass Shack in Kealakekua, Hawaii” by husband and wife duo Kanui and Lula. The native Hawaiians recorded this and a handful of other tracks for the European Parlophone label while living abroad in Paris in 1933. 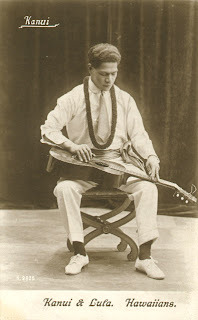 Bill Kanui’s lead vocals – sung in both English and Hawaiian – are powerful and pleasantly entertaining, and Lula’s island chant backing vocals give the song a delightful hint of the exotic. What really makes this rare recording essential, though, is Bill’s magnificent guitar work. He uses the steel liberally, creating an ethereal, shimmering sound that is in constant motion, never quite in tune, and yet remains as lullaby soft as an island breeze. Keep up the good work! I wonder what year in music your blogs will reach up to?